China beats its own record with the World's fastest supercomputer. Sunway TaihuLight, a newly built supercomputer from China, now ranks as the world's most powerful machine. During the International Supercomputer Conference in Germany on Monday, Top500 declared China's 10.65 Million-core Sunway TaihuLight as the world's fastest supercomputer. Moreover, the supercomputer is leading by a wide margin, too. With 93 petaflops of processing power, Sunway TaihuLight is nearly three times more powerful than the world’s previous fastest supercomputer, Tianhe-2, which had been the world's fastest computer for last 3 years with speeds of 33.9 petaflops per second. That's 93 quadrillion floating point operations per second (FLOP), which means the supercomputer can perform around 93,000 trillion calculations per second, at its peak. 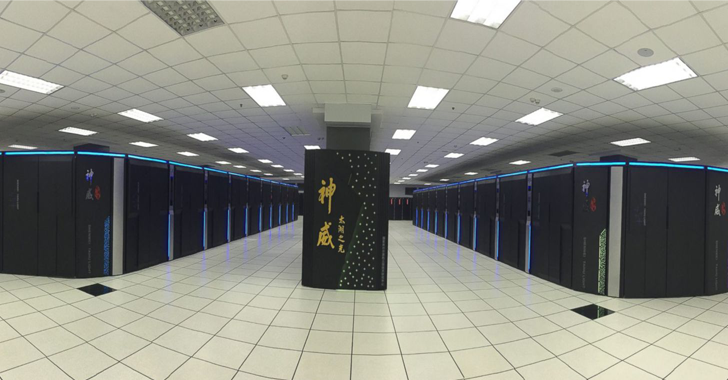 The Sunway TaihuLight supercomputer is installed at the National Supercomputing Centre in Wuxi. "Sunway TaihuLight, with 10,649,600 computing cores comprising 40,960 nodes," is one of the world's most efficient systems, with "peak power consumption under load (running the HPL benchmark)" at a relatively modest 15.37 Megawatts of energy consumption. The microprocessors inside Sunway TaihuLight are 100 percent Chinese. Sunway TaihuLight is powered entirely by Chinese processors (the 260-core ShenWei 26010) and runs on a custom Linux-based operating system. "As the first number one system of China that is completely based on homegrown processors, the Sunway TaihuLight system demonstrates the significant progress that China has made in the domain of designing and manufacturing large-scale computation system." In the past, China relied heavily on American processors for its supercomputers, but the US thought that China was using the Tianhe-2, which was built with Intel cores, to run its nuclear simulations. Due to this reason, the United States government banned Intel from exporting its powerful Xeon processors over a year ago to a number of Chinese supercomputer makers. The US decision did not halt the Chinese progress. Instead, it seems like the US policy has made an opposite effect. For the first time since the Top500 list began, China has overtaken the United States in the amount of supercomputers being used. China has 167 computers in the top 500 while the US has 165. "Considering that just 10 years ago, China claimed a mere 28 systems on the list, with none ranked in the top 30, the nation has come further and faster than any other country in the history of supercomputing," said the latest Top500 announcement. Sunway TaihuLight will be used in scientific research and engineering work in fields including life science research, data analytics, advanced manufacturing and climate, weather and Earth systems modeling.